Money can't buy great scripts, but it can build one helluva robot. If anyone remembers the 1998 adaptation of “Lost in Space” (starring, among others, Matt LeBlanc, Gary Oldman, and William Hurt), they likely remember the darkness. The new take on the short-lived ’60s TV series aimed to be a more action-oriented franchise starter, focusing on the “danger” more than “Will Robinson” or, more accurately, family-focused storytelling. Twenty years later, the Netflix version goes back to basics, but can’t quite nail the tone. Even though it draws from storylines built into Irwin Allen’s unaired pilot (in addition to the rest of the series’ popular arcs), “Lost in Space” 2018 can’t blend old school sincerity with new age thrills. It’s too focused on kids and thus blind to the nuanced originality often appreciated by adults. Season 1 can be laughably cheesy and one-dimensional, even when it steamrolls ahead with its daredevil story. “Lost in Space” starts in a crisis and only creates more from there. The Robinson family, who we meet for the first time during a less-than-spirited game of Go Fish, is hurtling toward the surface of an unknown planet and ends up crashing on a bed of ice. After everyone abandons ship, the Jupiter spacecraft sinks into the lake, taking everything they need with them. So this is the nerdy scientist family’s first obstacle in what quickly becomes a series all about problem-solving. The hatch is open, but it’s stuck in a way that adults can’t fit through. A kid can dive down and retrieve supplies, but the temperature is dropping and there’s only so much time before it freezes. What do they do? If you’re the Robinsons, then you use your various intellects and infinite resourcefulness to come up with a plan that educates as it entertains. “Lost in Space” should be commended for encouraging an interest in science by illustrating its importance; it’s hard to imagine more life-or-death scenarios solved with knowledge of the periodic table or applied mathematics than what’s seen in these 10 episodes. Plus, the whole thing is done under a family-friendly TV-PG rating. It knows its audience and tries, at least, to cater to their interests. But as entertainment, the show only works when it’s building suspense in those perilous situations, and that becomes redundant. The dialogue, relationships, world-building, and performances all feel half-baked, as if they don’t matter as much as depicting the cold hard facts of survival. That’s a substantial portion of the show overall, and it’s likely more than enough to turn off anyone who’s not watching with younger viewers or a die-hard science-fiction fan. 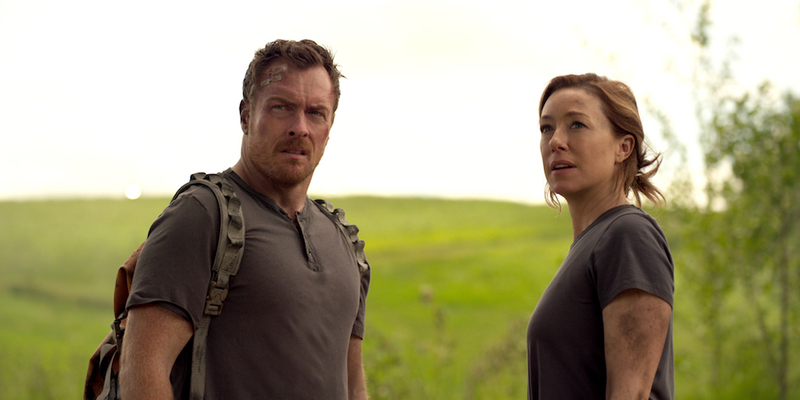 Take, for instance, when Maureen (Molly Parker) and John (Toby Stephens) get stuck in a tar pit during Episode 8, “Trajectory.” They’re trapped, and they’re sinking into hot, black tar. First, Maureen asks if the ground around the pit could sustain their weight — if so, they could just walk out. John dismisses it quickly, but it sure looks like they could’ve simply walked out of the pit. That’s a problem. There’s no valid reason given for not choosing or at least testing that option, which makes what comes next feel like their fault. After sinking further, John uses a grappling hook to try to swing off the rover onto safe ground. But as he secures the rope, the craft starts to dip under the surface. His wife pulls him back inside rather than trying to swing out. Why? Why is it safer inside a submerged vehicle inside the hot tar than trying to swing out as planned? Again, this feels wrong, instinctually. In the end, they escape using helium and cabin pressure to tunnel out to the surface. Setting aside how their tunnel magically emerged on shore — so they didn’t have to cross any of the solid tar they chose not to walk across earlier — there’s no reason to question this. The science sounds solid. Everything about “Lost in Space” seems to be built on knowledge, so even if you don’t fully understand the science (the author raises his hand), you trust it. In fact, the writers seem so focused on the science, it’s like they’ll make their characters do anything to get to that last step; to get stuck in a situation where they have to use their minds to survive. The only problem is that Maureen and John look pretty dumb up until they escape. It looks like they chose poorly, and looks matter when you’re constantly asking your audience to trust your logic. For the most part, the thrills still achieve the desired effect, even if what’s around them hampers the overall adventure. John constantly reminds us he’s a big burly soldier man by grunting every two seconds and bluntly dropping broad dialogue. Maureen is so anxious she makes viewers anxious; it’s clear she’s a mother shouldered with immense responsibility, but the show would’ve benefitted greatly from letting Parker do anything other than shout, cry, or generally tense up. The kids are… fine; not spectacular, not annoying. They seem like pretty good role models for kids watching, even if they, too, have to spout some pretty outrageous exposition.